Do you love dogs, exercise and being outdoors? Join the DogCentric dog walking team! 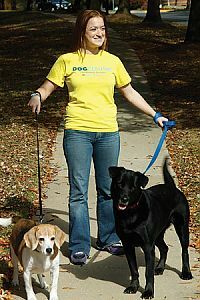 DogCentric is a professional mid-day dog walking service that offers customized, private visits. DogCentric was voted a "Top Dog Walker" in Washingtonian Magazine’s “Best of Pets” issue, "Best Dog Walking Service" in Bethesda Magazine's Best of Bethesda issue, and is also the official dog walking service for the Humane Rescue Alliance. We are currently hiring for routes that fall within 11am - 3pm or 11:30am - 3:30pm, Monday through Friday. Applicants must have complete availability Monday through Friday during one of these two time periods to apply and must be able to commit to the schedule for a minimum of 6 months. Employees are eligible for reimbursement for a pet first aid certification class, flu shot reimbursement, and potential for a raise after 6 months. Walkers are compensated starting at a minimum $8 per 30 minute walk with one dog and $10.50 per 30 minute walk with two dogs. This averages out to $12-$16/hour. Request an application to join our team by emailing your interest to bark@dogcentric.com. No phone calls please! Specify whether you are applying for the regular walker position or the substitute walker position. If we are interested in scheduling an interview with you, you will be contacted by phone or email.